CBS commentator and LPGA champion partners with Saratoga optician for new brand. When CBS golf commentator and LPGA champion Dottie Pepper told Saratoga Springs optician Susan Halstead that she was having trouble seeing the ball, Halstead designed a pair of special prescription sunglasses for her. That was three years ago. 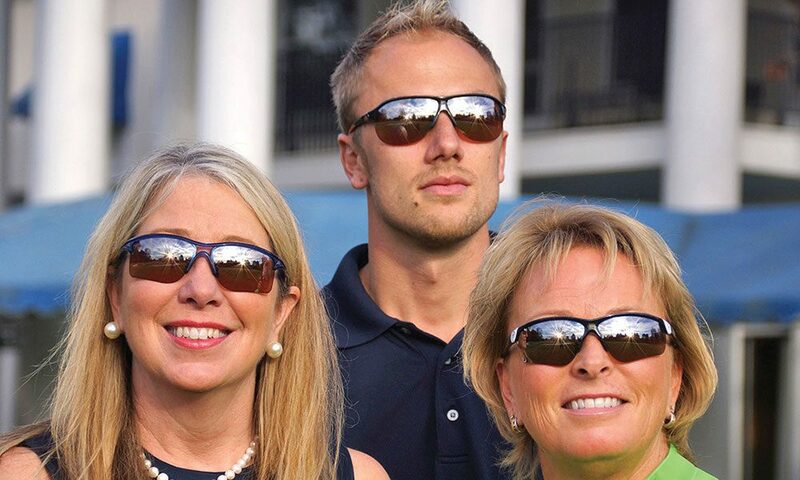 Now, after many months of product development and testing, Halstead and Pepper are getting ready to market Pepper ProEyes, their own brand of unique prescription sunglasses, across the nation. While aimed at golfers who want to improve their game by optimizing their vision, Pepper ProEyes could be worn for many sports, they say. Pepper and Halstead, who are equal partners in the venture, plan to open a virtual store for online ordering in early January and do a soft launch in the Saratoga area. “Our goal is to open it up nationally sometime in March or April,” says Halstead. Halstead is the owner of Family Vision Care Center, a 97-year-old business that she bought 20 years ago after working there as an optician. Pepper is a two-time major champion and 17-time winner on the LPGA Tour. In 1993, she won the ESPY award for best female golfer. Pepper, who has been a patient at Family Vision since she was a girl, went to see Halstead a few years ago because of vision problems she was having while both golfing and commentating. “When she put her head down to address the ball, she was in the wrong power of the lens, so the ball was blurry. In order to get the ball clear, she had to adjust her head position, which threw off her swing,” Halstead says. Halstead designed lenses with a large, wide distance viewing area at the top, and a very small reading area low in the lens, much lower than in a traditional progressive lens. She eliminated the troublesome intermediate vision. “It’s more like single vision distance with a small line of bifocal, but there’s no line,” she says. The lenses also react to light, changing colors from yellow to copper depending on conditions, so they can be worn from dawn to dusk. Online, three types of Pepper ProEyes sunglasses will be available: Pepper ProProgressive, with prescription lenses for distance and reading; Pepper ProMillenials, for golfers who don’t need a reading prescription, but would benefit from peripheral clarity and a gentle boost for reading a cellphone or scorecard; and Pepper ProSun, ready-to-wear, non-prescription sunglasses with a wide peripheral and reaction to changing light. In the online store, customers will pick a frame and then upload their prescription or contact information for their optometrist or ophthalmologist. A selfie photo will be used to take other optical measurements. A pair of prescription Pepper ProEyes will cost from $699 to $774; ready-to-wear sunglasses will retail from $349 to $424. Eventually, Pepper and Halstead hope to show their product on the PGA Tour and sell the ready-to-wear sunglasses locally at selected country clubs and stores. For more information, visit pepperproeyes.com or Pepper ProEyes on Facebook.